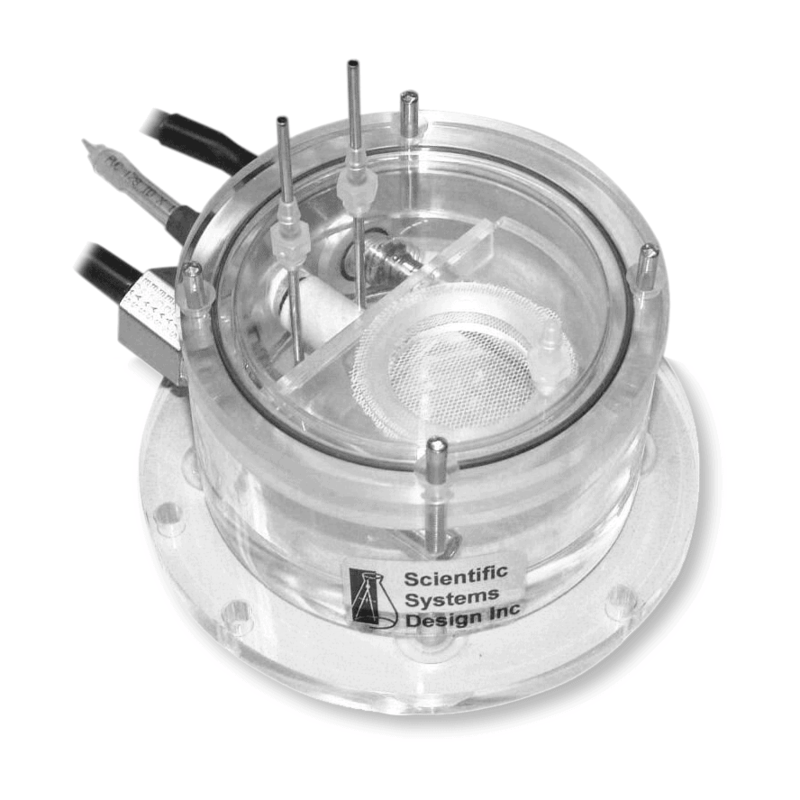 The Brain Slice Keeper AM has been designed to pre-incubate brain slices prior to transfer into recording chambers. The main body of the BSK-AM comprises a chamber fitted with stainless steel heater and sensor probes to maintain the desired incubating temperature, regulated by our temperature controller PTC03. Within the body of the chamber is a holder for resting the slices, it consists of a pair of closely fitting acrylic rings, upper and lower, between which is wedged a removable sheet of nylon netting. 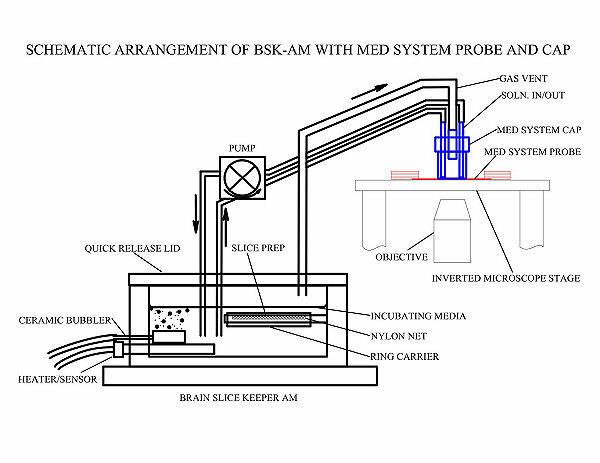 In operation, the BSK-AM is filled with ACSF so as to totally immerse the net and ring. A ceramic bubbler to one side is supplied with 95% O2/ 5%CO2 gas mixture to both saturate the ACSF and to produce circulation of the ACSF from the top downwards on to the net surface on which brain slices are placed. The circulation also provides for even heat distribution and feedback control from the heating element and sensor elements below. A deflector shield between the bubbler and the base of the nylon net prevents bubbles from being trapped under the slices and ensure continuous circulation of medium. Slices remain viable for many hours in these conditions. The BSK-AM fluid volume is typically 150ml. A close fitting lid with a sealing ring carries two stainless tubes into the base of the chamber. These tubes can be used to provide ASCF to the Alpha MED Sciences Perfusion Cap for their multi-electrode array probes. A third venting tube carries humidified oxygen which can also be used to supply the Alpha MED Sciences cap for interface slice applications. Click here for a recent publication using this chamber.